Spring in the Keweenaw. We are not amused. 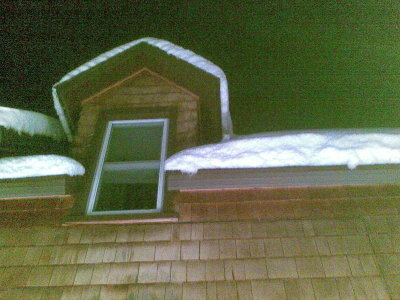 There was well over a foot of snow on my roof tonight. Well, I'm just peeved enough to take two crummy videos with my phone. By popular demand, here's a compilation of the photos and video of Tom moving snow. 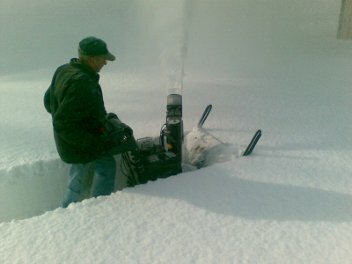 Prior to using this snowthrower (a 30" Poulan Pro), Tom had been snowshoeing to the barn to avoid disturbing the insulating layer of snow over his water line. 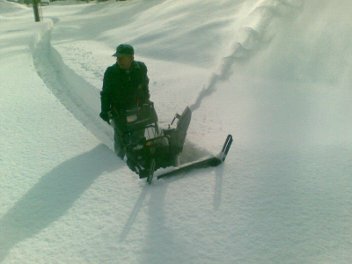 Here he uses the snowthrower to go around the back of the house, and create a walking path to the barn. Tom pauses for a quick break. The snow is just as deep as the auger housing is high. The path is nearly complete. This was snow that hadn't been touched until this point. He nears the barn. 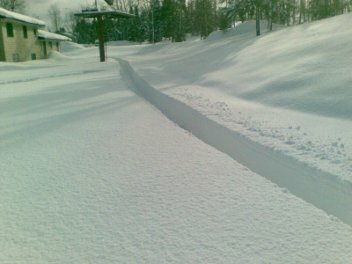 After this run, he went back and doubled the width of the path. I walked up the path behind Tom to take this short video. 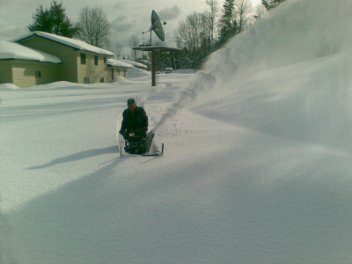 The Village of Laurium has excellent snow removal. I don't live in the Village of Laurium. On my block, I have to wait for the county grader to come by. There was about a foot and a half of snow on my street this morning, with drifts higher. 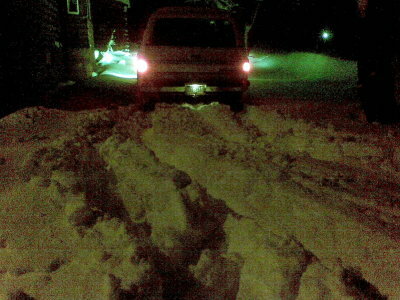 I got to the end of my block and saw a car stuck in the berm left by the Village plow. It was a Subaru. AWD. Uh-oh. I thought the other side of the lane looked passable, but it wasn't. I got stuck and ended up walking back to my house for a shovel, and just as I had my car almost dug out, the grader pulled up. Um, sir, you appear to be inching up on my car. Please don't scratch my pristine paint job. It turns out he saw the rear hitch on my car with the ball mount in it, moved his blade up to push me through the berm with it. So, if you can't be early, at least you can be helpful. Thanks, grader guy. 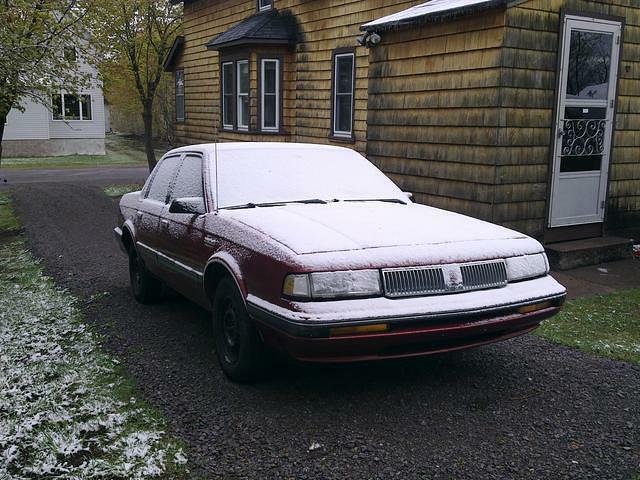 Have you winterized your turn signals? Now that winter's here, you've probably already done the usual pre-winter auto maintenance. You've checked your battery, installed snow tires, and gotten that oil change out of the way. But have you winterized your turn signals? In this season of cold temperature, decreased visibility, and increased stopping distances, it's critically important that you not use your turn signals at all. In winter conditions, use of your signals could result in electrical malfunction, loss of control, or the little green car behind you knowing which direction you're turning. Therefore, the best thing you can do to keep your turn signal circuitry in operating condition is to disable them completely during winter months. Some vehicles, such as BMWs and Buick Enclaves, come from the factory with their turn signals disabled. If you're not sure whether your vehicle's signals have already been disabled, because you've never tried them, check in your owner's manual or with your local dealer. Dealer service centers are specially trained to be familiar with the obscure and typically unused systems of your car, such as your turn signals. Just remember: For winter safety advocate, remember not to indicate! Weblogs without pictures are boring. So here's a picture. I (and Scout) put up lights last night. They're the tiny LED kind, vintage last year from Pamida. I bought a set of simulated-C9-size LED lights from Wal-Mart last month, but they're really lousy. I've never seen dimmer yellow LEDs. To my credit, I spent five minutes in the store looking for an outlet to use for testing, with no success. In the return pile (i.e. the back seat of my Neon) they go. Heh, you can just make out my scary deer head inside the front porch. Came with the house. In fact, I'm almost sure it's as old as my house. When I finally rolled into Laurium last night, with the rental car's computer showing a trip total of 3100 miles, I was happy to see that there were not four feet of snow in my driveway and yard. There were probably six inches on the ground, but it was too late to wake up my neighbors by firing up the plow truck, and besides, its battery was flat. So, this morning I drove to the airport to drop off the car rental contract I had forgotten to bring with me when I returned the car last night (oops), charged, gassed, and aired-up the plow truck, and made short work of the snow in my yard. Later, while flipping through images captured by my webcam, I found that some of the exciting snow plowing action had been recorded. So, for the benefit of those who don't have snow right now (Hi, family!) I put up the pictures.